Most days David and I go for a three mile exercise walk through the woods. During the cooler spring and fall days we substitute that for a session of cleaning the woods. We pile our pick up truck high with dead fall and bring it down back to an immense brush pile we've been building for years. We love the neat woods and it helps with the exercise program. This week, as I was directing David in backing up the old pick up, I noticed some feathers on the ground. I then realized there were a whole lot more than a few. Apparently there had been a recent kill on the edge of our brush pile and all that remained was a scattering of feathers. 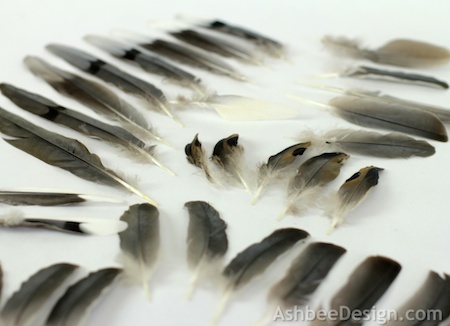 Not sure if I ever mentioned it before but as we walk, I collect feathers (and seed pods, and pine cones, and sticks, and stones, and birds' nests and robin egg shells and......). 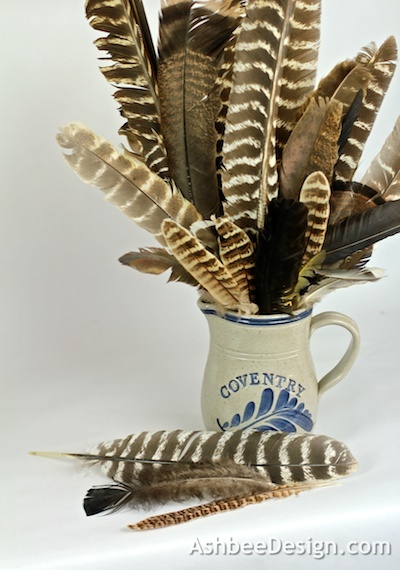 We gathered all the feathers and I used some for a tiny arrangement. 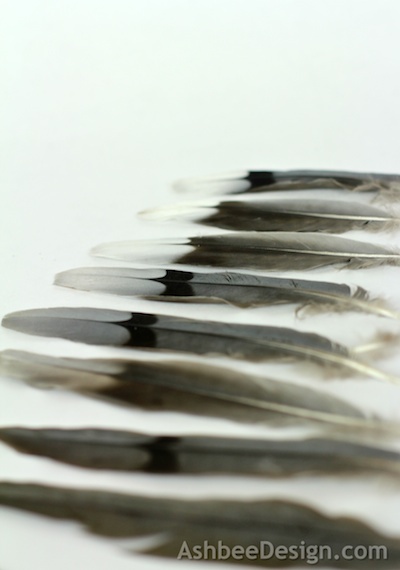 I can't identify most birds from found feathers but these had a few very distinctive patterns including the black spot on brown and the white tipped with black swoop. Anyone know what bird this was? 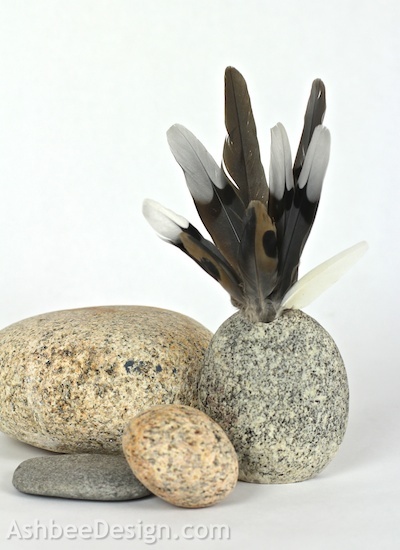 The feathers were a perfect addition to the drilled stone vase given to me last Christmas from my sister and brother-in-law. At first the feathers were too tiny and just slid into the hole but then I considered using brown rice as a filler. A perfect solution to holding the feathers in place! Like the vase? I love it. 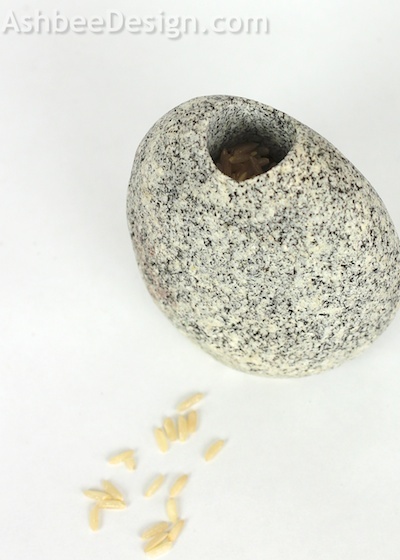 Check out the collection available in Maine granite from the Portland Museum Store. When I find a feather I always collect it. I don't find them often, and rarely in a quantity like this. For years I have stuck every feather into a pitcher I have (now two) which create a year round, never need to water, arrangement. I have a lot of turkey feathers! And a few other interesting ones a well. 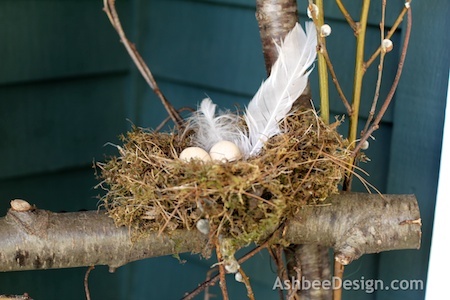 But the point is, I always have a collection for when a need a feather or two for a project - like my birds' nests ladder from a few weeks back. Brown rice is such a great idea! I was hoping you had made the rock vase so you could tell me how you did it! Love your stuff! Thanks Karen. No, i didn't make the vase but would love to be able to. 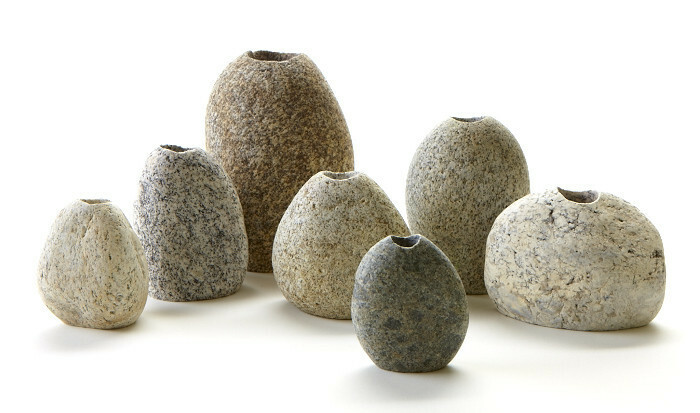 I have drilled holes in stones- very slow going, but have never had the tools to flatten an edge to make vases. Love them though. Clever idea; we have a variety of poultry and my god daughter is always bringing me feathers she finds out in the bird pens. I'd love to have a ready source of feathers. I think I'd incorporate them into woven wall hangings. I love your feather collection! They are such a pretty reminder of Nature. Yes, they are. And they compliment my home which is filled with reminders of nature. They are reminders of years of special walks with special people in special places. Pretty feathers! The rice idea is great. Thank you for sharing it at What We Accomplished Wednesdays. Have a great weekend! The rice made it doable. The feathers just got lost in the vase without it and larger feathers looked over-sized. 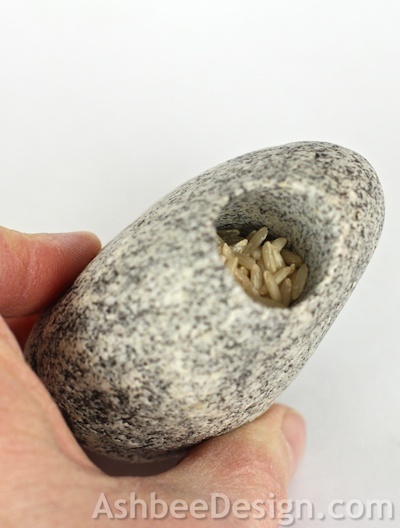 Love this rock vase! Nice idea. Thanks for linking up at Romance on a dime!! Thanks Haley. We do have them here.